For those of us who love to crochet, any season is the right season to crochet. 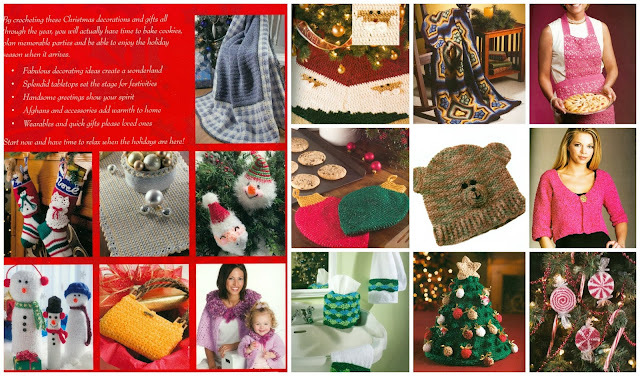 However, crochet patterns specifically for Christmas decor and fashion, are often a lot of fun to make. Plus, crocheted items are fabulous gifts to give to loved ones and friends! 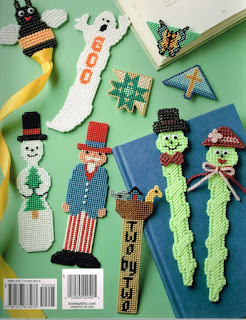 Tis the Season to Crochet is packed with wonderful crochet patterns. 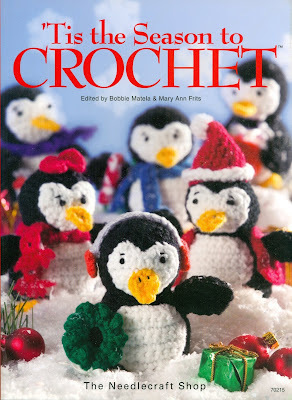 The crocheted penguins on the front book cover are only the beginning. 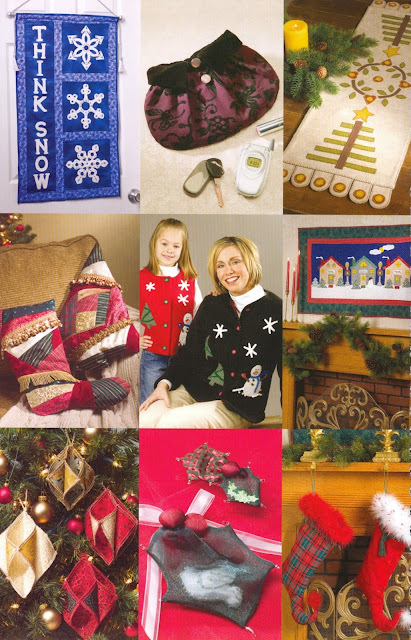 The book also includes crochet patterns for ornaments, tree skirts, stockings, afghans and other home decor. Plus, it features patterns for beautiful sweaters and fun holiday hats in fashion. There are approximately 50 holiday crochet patterns in "Tis the Season to Crochet". The skill level for the patterns varies from easy to intermediate. As you can see for yourself, there are enough patterns in the 150 pages in this book to keep you busy crocheting for many seasons! Even though I crochet myself, I have been blessed over the years to be gifted with crocheted items made by friends. These gifts are easily among my favorites, and most cherished gifts ever received. Perhaps, that is partly true because I know how much work goes into making them and I recognize that every inch of the yarn was lovely touched by my precious friends. However, I don't think you have to be a crocheter to recognize the beauty or value of a crocheted gift. Neither my mother nor my daughter crochet, yet they always appreciate a handmade gift. Not only that, they use them! There really is no greater compliment to a crafter of any kind, than to see their creation being used, loved, and cherished. Everybody loves an adorable snowman during the holidays and this one is fabulous! 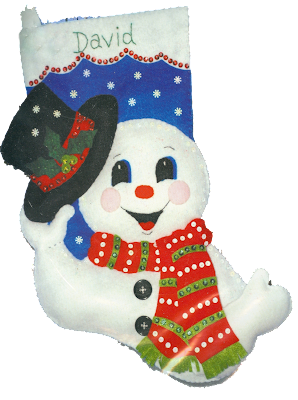 This snowman, tipping his felt hat and waving, is such a cheerful greeter for Christmas and would be adorable in any home. He is featured on a stocking in this kit, but it is always easy to use the templates from a kit and create something totally different. He would be so pretty on a front door wreath! Such a happy smile makes us all smile right back at him. The holly and berry decorations on his felt hat are simple, but they are the perfect touch of beauty for his holiday black top hat. Overall, the snowman on the blue snowy background is a beautiful combination of color in addition to be a lovely image design. The instructions to make the personalized stocking as shown in the picture, are included with the kit. The snowman image frequently brings back wonderful memories of building a snowman together. I know I always think of my husband and children building their annual snowman together while I watch from the window or run out to take pictures. This would, no doubt, be a treasured keepsake! Kits sure make things easy on crafters by including everything we need in one package. It is so nice to not have to search for dozens of floss colors, sequins and other embellishments. It's all put together for you. For this kit, the only thing that would need to be purchased separately is the stuffing if you choose to use it. 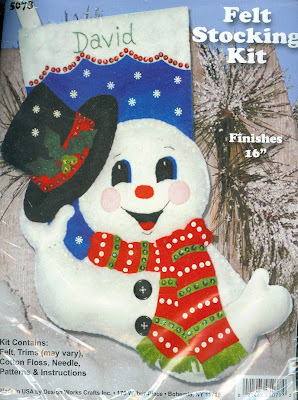 The Snowman Felt Stocking Kit was created by Design Works Crafts, Inc. The finished stocking would be approximately 16". As with any of the felt stocking kits, you would need to purchase the Fibre Fill Stuffing separately. Whether you use these handmade felt bags as gift bags or as favor bags for a party, they are fabulous! Not only will they hold wonderful surprises, but they are a gift themselves that the recipient can keep. They would be really pretty hanging on a Christmas tree if they were empty or filled with something very lightweight. Each bag measures 3¾" x 5". Kit contains supplies to make 4 mini felt bags. They are just the right size for Christmas candy, therefore they are perfect for holding party favors. Or, you could fill them with money or a gift card for that "hard to buy for" family member. Not only would they be great as favor or small gift bags, they would make great place tags on the Christmas dinner table too. At Christmas, we are often rushed and in a hurry. Should you find that you really need to finish these mini bags quickly before a party, you could glue the decorations and sequins onto the mini bags with craft glue. Aleene's craft glue dries clear and is great for all kinds of crafts. I have several bottles around my own house. I keep one bottle in the kitchen cabinet for quick access. If you do a lot of fabric crafts, you may prefer Aleene's Fabric Fusion. Regardless of the occasion or use, whether you use them as gift bags, party favors, table place tags, or Christmas decorations, they will be lovely. 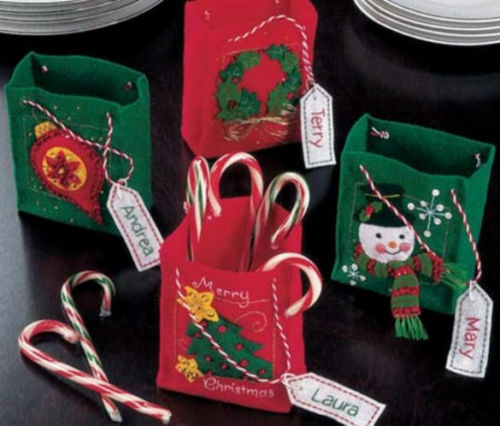 These mini gift bags will add a wonderful handmade touch to any Christmas celebration. Plastic Canvas is by far the easiest Needlepoint craft! Bookmarks are among the easiest plastic canvas item you can make. Therefore, this book is a must have for everyone who enjoys plastic canvas. 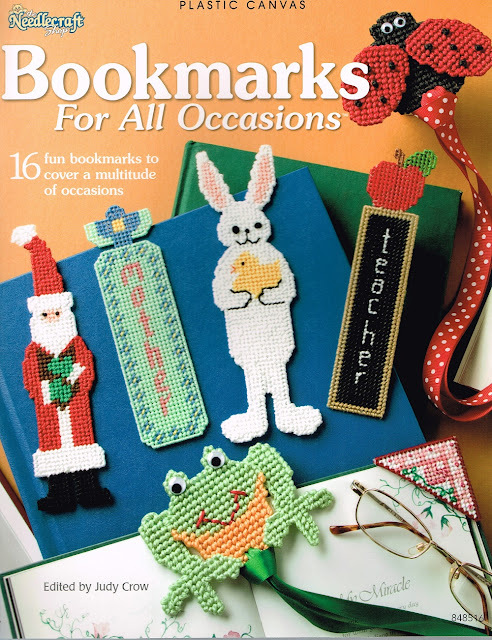 The Plastic Canvas Bookmarks for All Occasions book has lots of awesome plastic canvas holiday designs. 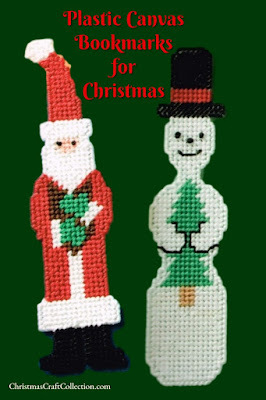 The Santa and snowman are the two Christmas bookmarks featured in the book. Those two designs alone are enough to recommend the book. However, you will be thrilled with the additional holiday plastic canvas bookmark designs too. They include a bunny rabbit for Easter, a ghost for Halloween, Uncle Sam for the 4th of July, a special design for Mom on Mother's Day, and several others that would be fun to make and give. All plastic canvas enthusiasts will want this book on their shelf! Actually, they will want it off the shelf and in front of them while they stitch beautiful bookmarks for the holidays. Bookmarks make great gifts for friends and family. They are also ideal for using as decoration or tags on a wrapped present. Each time the recipient marks their place in a book, they will think of you. They really are wonderful fast and easy handmade gifts. The book contains designs for 16 fabulously fun bookmarks created for a variety of holidays and special days throughout the year. The ladybug, bee or frog bookmarks would be awesome for any day, but perfect for a child's birthday. These cute bookmarks will encourage a child to pick up a book and read just so they can use the bookmark. All of the patterns in this book are beginner rated and there are color diagrams of the basic plastic canvas stitches in the back of the book. They make an excellent quick reference when you are reading the directions, especially for finishing the piece. For each pattern, the diagram is printed as well as a photo of the finished bookmark. That makes it extremely easy to follow the instructions. One of the things I like best about sewing pattern books is that they offer so many options. Pillows, handbags, home decor and apparel can often be adapted for the holidays by your fabric selection. For instance, there is a pattern for pajamas in the Sewing Basket Fun book that could easily be make with a cotton print Christmas fabric. That is also true for the apron pattern. So many ideas and patterns that could be easily converted to a holiday design. These sewing projects would also make wonderful Christmas gifts! A Christmas gift clearly does not have to be a Christmas fabric or pattern. 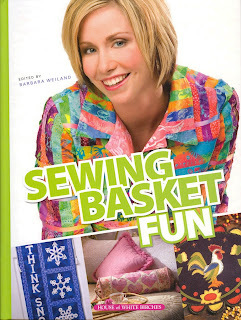 This book is truly packed full of instructions to make dozens of lovely sewn items. The instructions are detailed with lots of illustrations as well as photos of the finished projects. 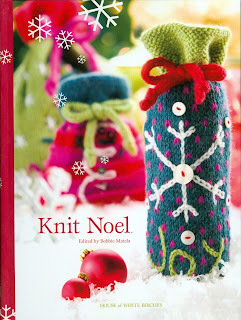 Here are some of the Christmas projects included in this fabulous book. But do keep in mind, for many of the projects in the book, a simply fabric change could also make that pattern into a Christmas sewing project. One of the things I like best about Sewing Basket Fun is that it is spiral bound inside the book so the book will lay open flat while working on a project. It truly makes glancing back at the instructions while sewing so much easier! Whether you are searching for a dining room table centerpiece, a special table decoration, or a lovely Christmas decorative mantel display, this Snowman and Sleigh Winter Wonderland felt kit will be the perfect choice. Each piece of this display is lovely! From the adorable snowman bearing gifts, to the precious reindeer pulling the sleigh full of presents, this centerpiece is totally precious. It exemplifies the wonderful magic of Christmas and the holiday season. This kit would be especially awesome for someone who isn't a huge Santa fan, but still embraces the enchanted beauty of Christmas. It really is the perfect winter wonderland scene. I prefer kits because they come with almost everything needed to make a beautiful decoration. 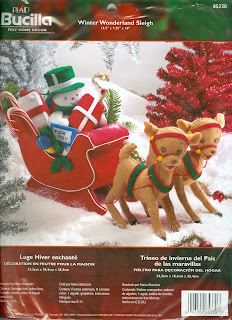 The Winter Wonderland Sleigh Felt Kit by Bucilla is no exception. It includes the stamped felt for easy piece matching, the cotton floss for stitching, the chenille sticks for added decoration and of course, the instructions. One hint that might help, when I assemble my felt kits, I put the pieces together with fabric craft glue and stitch after it drys. That step is certainly not necessary, but I have found it helps me hold the pieces together while working on the project. Plus, should the threads break during the years of display and use, the centerpiece will not fall apart before you can repair the stitches. The overall finished size is 13 1/2" x 7 1/4" x 10". This will definitely be a decoration you will not be in a hurry to put away. Even through it bears the traditional Christmas colors of red and green, it is still a lovely wintry scene. Buy today's featured Kit Now - Bucilla Winter Wonderland Snowman & Sleigh Felt Centerpiece Kit - I'm sorry, but this item is currently sold out! Please visit the House of Sylvestermouse eBay Store to View Available Felt Kits. Candy Canes have long been associated with Christmas! We see the candy sticks hanging on Christmas trees, added to stockings, often featured in Santa's bag of goodies, part of outdoor decor displays, and used in lots of fabulous crafts. The are even crashed to use in recipes or added to hot drinks as seasonal decor. 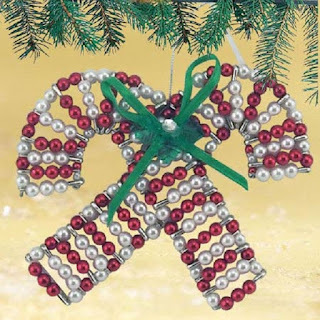 These candy cane ornaments are the perfect beaded ornament for anyone, even those who do not celebrate Christmas. My own grandmother used to decorate her Christmas tree with candy canes. Kids young and old were welcome to grab a snack right off the tree. From my point of view, I didn't want anyone to take one because I didn't want my grandmother's decorations removed, but the family seemed to enjoy eating the candy nonetheless. These ornaments are a fabulous reminder of that tradition without using real candy that could grow stale. The ornament kit includes the wire, beads, pins, the ribbon embellishment and the hanging cord. There are enough supplies to make 2 candy cane ornaments in the kit. I suspect the color of candy canes has a lot to do with the reason why they are so popular at Christmas. The red and white are perfect! The green bow on these ornaments literally ties in the second traditional color of the season. Not only would the ornaments be beautiful hanging on the tree, but they would make lovely ornamentation for gifts. Therefore, you would be giving the recipient two gifts. Whatever is in the box, plus the candy cane ornament to hang on their tree for many years to come. 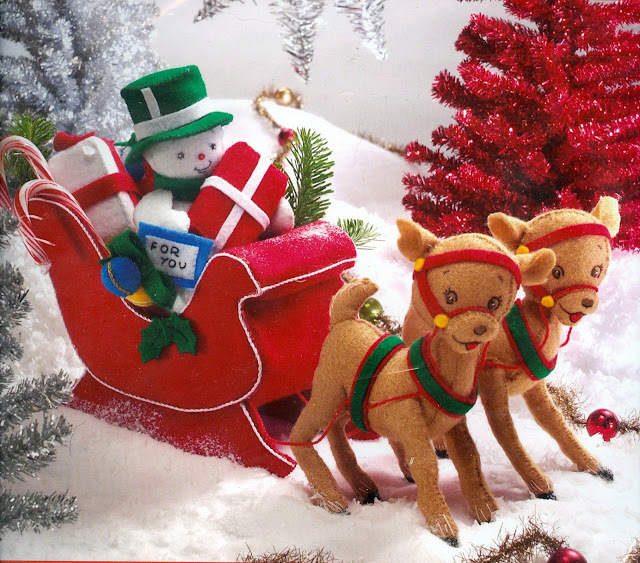 Please visit the House of Sylvestermouse eBay Store to View Available Ornament Kits. For those of us who knit, there are few things better than a book full of knitting patterns, especially easy knitting patterns. Knit Noel is chock-full of fabulous knitting patterns. 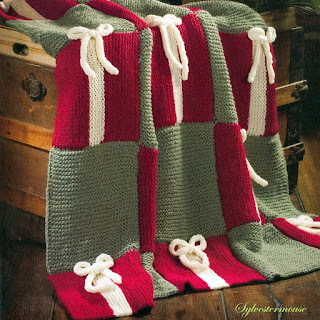 In this book, there are patterns for stockings, afghans, and other Christmas home decor. It also features patterns for sweaters, knitted belts, scarves purses and more patterns for apparel. Any finished item in this book, would make a wonderful Christmas gift for loved ones and one that would be cherished by the recipient. Each pattern in the book has a skill level rating so you know before you start if the pattern is a good choice for you. A knitter can tell by looking at the photos, that most of the stockings are going to have an "intermediate" skill level, but I love that the book includes fast and easy patterns as well. For Beginners, never fear, there are several patterns in this book that are gorgeous and just for you! The garter stitch afghan shown below is one of the beginner pattern, yet it looks quite impressive finished. The easy patterns in a knitting books are always appreciated. Even a knitter who is quite skilled in the craft enjoys an easy pattern they could make quickly to give as a gift. 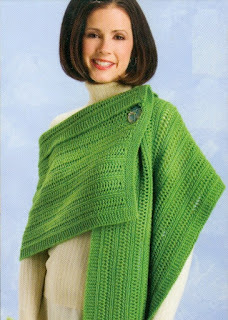 The wrap pictured before is one of the easy knitting patterns included in this book. There are over 50 knitting patterns included in this book. You can see more photos by clicking here: Knit Noel on Ebay. Of course, you can also purchase the book by clicking that link and I know any knitter will love this book. If you don't knit yourself, but you know a knitter, you might consider giving them the book as a gift. But, do be sure to mark your favorite pattern with a bookmark. You just might gind you are the recipient of a fabulous handmade gift yourself. A lovely addition to home decor during the holidays is a set of Christmas hand towels in the guest bathroom. Or, perhaps you would rather treat yourself to a lovely set of towels. 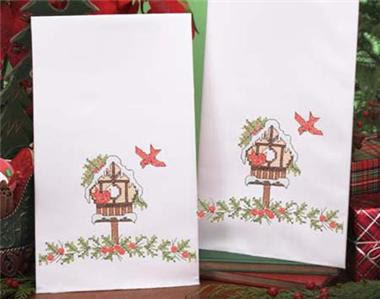 The cardinal chalet hand towels would be adorable in either restroom or even in the kitchen. They make a pleasant greeting wherever you choose to place them. The red berries and green holly are the perfect colors for Christmas decor. However, these hand towels could be used throughout the winter months. For those of us who love birds, this cardinal flying to his safe home would even remind us to set out food for our feathered friends during the harsh winter months when easy food is scarce. This set of two hand towels for you to cross stitch is technically referred to as a kit since the package includes two stamped hand towels. However, the floss is not included with the towels. That is not necessarily a bad thing though. That actually allows us to select the hue of color that best suits our own home decor. Personally, I tend to prefer a darker green than the traditional Christmas green. I also have a very specific preference in my selection of reds. I like what I refer to as a real red, not an orange red. So, for me and probably some of you, selecting my own floss to use when cross stitching is most often a preference. The hand towels are stamped with the design on poly/cotton blend 19" x 34" towels. Not only would these hand towels be beautiful in your own home, but they would also make a fabulous handmade gift for someone you love. Perhaps, you could keep one towel for yourself and give the second one as a gift to someone special. Red ornaments are always among the most popular color for Christmas regardless of current decorating trends. The traditional Christmas red is a part of every Christmas home decor. Paired with white, the color combination is quite stunning. These Red Rubies and Snowdrop ornaments are beautiful! Many of us live in regions where it snows every Christmas, therefore the snowdrop name and white accents are totally appropriate for our Christmas ornaments. The Rubies and Snowdrop Ornaments kit comes with enough supplies to make 2 ornaments. That means you can make one ornament for yourself and give the second ornament to a friend or relative as a gift. That would certainly be a lovely annual tradition to make 2 ornaments just alike and give one to someone you love. After a few years, you would both have a beautiful collection of ornaments that are sentimental and cherished. 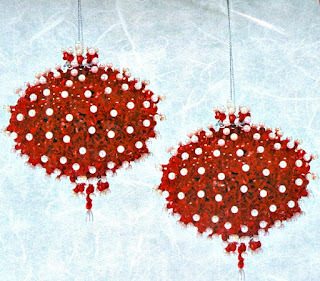 The beaded ornaments are made by pinning the red snowflake shaped beads to the Styrofoam ornament form with the white head pins. I use craft glue on each pin to make the decorations permanent. I have found that the pins can, and will pull lose from the Styrofoam form over the years. If they are glued in place, they won't pull out and get lost. For additional tips on making beaded ornaments, visit How to Make Your Own Beaded Ornaments. 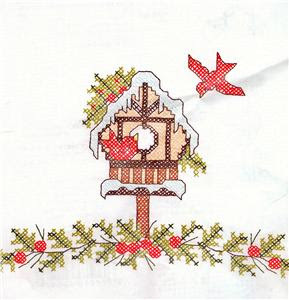 The sample ornament used in the article is not one of the ornaments from the Rubies & Snowdrops kit, but the tips and instructions are applicable for all beaded ornaments.